Ugandan police have blocked gay pride celebrations from happening in two resorts outside the capital, Kampala. Gay rights activist Frank Mugisha said more than 100 LGBTI people tried to participate in the celebrations in Entebbe near Lake Victoria. But many were escorted by police back to Kampala in minibuses. The minister for ethics and integrity had threatened to mobilise mobs to attack participants. Homosexuality is illegal in Uganda. After being blocked from entering the Entebbe resort, several dozen participants moved on to another resort but were kicked out by officers. 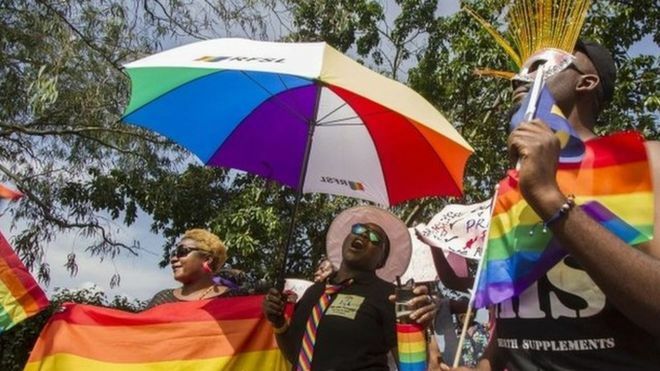 This is the second time the LGBTI [lesbian, gay, bisexual, trans, and/or intersex] community has tried to hold gay pride celebrations in Uganda this year. In August, the authorities broke up a beauty pageant and arrested activists. The BBC’s Catherine Byaruhanga reports from Kampala that it is unclear why this event was targeted, as over the past four years celebrations have been held without much notice from the police. In 2014 a bill to further criminalise homosexuality was overturned in court.